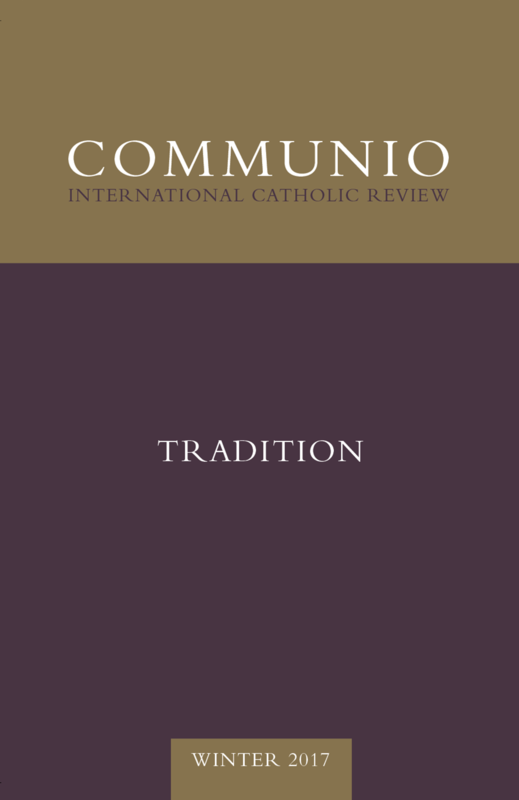 The Winter 2017 issue of Communio is dedicated to the theme of “Tradition.” Ecclesial tradition begins with the Father’s action of delivering up his Son for our sake, and always consists in commemorating this gift by carrying it on, above all in the eucharistic sacrifice. There is, however, an ambiguity embedded in the word “tradition” (parádosis in Greek, traditio in Latin). In its verbal form, the word is used by the biblical authors to refer to the Passion not only as the hour in which the Father “transmitted” the Son (Rom 8:32), but also as the event in which Judas “betrayed” Jesus (Jn 13:21, 19:11) and Pilate “handed him over” (Jn 19:16) to be crucified. The authors collected in this issue reflect on the principles that enable us to discern faithful adherence to tradition from spurious betrayals. Attending to the natural precursors of sacred tradition, they likewise bring to light how only obedience to what has been received can bear fruit in original thought and action, and thereby help us to see why tradition is an essential human good. José Granados, in “From Flesh to Flesh: On the Sacramental Meaning of Tradition,” elucidates the role of the body in the faithful preservation of tradition. Following St. Irenaeus, Granados maintains that the apostolic testimony is remembered throughout the ages of the Church by the sacramental incorporation of her members into Christ’s life. “The sacraments are, therefore, the place where tradition is realized, that is, the communication of the Gospel; and they are this place inasmuch as they contain this same corporeal Gospel, since they incorporate us in different ways into the Body of Christ.” Marriage has a unique role among the sacraments in this handing on of Christ in the flesh: in the begetting and rearing in which it bears fruit, the love of spouses offers the natural foundation for all human tradition. This insight, Granados goes on to show, has implications for the reception of the Apostolic Exhortation Amoris laetitia. Nicholas J. Healy Jr., in “Henri de Lubac on the Development of Doctrine,” examines de Lubac’s conviction that the Church’s doctrine is first given as a whole in the person of Jesus. “Before dogma is something the Church formulates, dogma is something Christ himself is; dogma is first and foremost Christ himself as incarnate Word and enfleshed truth.” As Healy argues, the French Jesuit both carries on and deepens Newman’s insight into the “organic” pattern of doctrinal development with this insistence that the fullness of tradition is present in its beginning. The Church’s unfolding of the deposit of faith flows from, and is at the service of, her bond with Christ, who gives himself over to his Bride in his eucharistic flesh and blood. Offering this principle as a standard for any evaluation of genuine development, Healy discusses the significance of Amoris laetitia in view of this nuptial understanding of tradition. In “Taking Truth for Granted: A Reflection on the Significance of Tradition in Josef Pieper,” D. C. Schindler articulates tradition’s indispensable role in founding and liberating human community. As that which is handed down from one generation to the next, tradition both transcends the ages in which it is remembered, and, for this reason, unites its beneficiaries across time. However, tradition does not merely hover above particular periods of time, but is concretely transmitted in the flesh of history. In this way, tradition manifests truth as a gift that must be freely shared and freely assented to in order to be received, and so as an event that can only be realized from person to person. Schindler explains how this inherently-generous form of its delivery reflects tradition’s primary content: the divine goodness out of which all reality is freely given its beginning. Colin Miller, in “Technocracy and Tradition,” scrutinizes the anthropology behind technocratic society, arguing that its exaltation of its inventions threatens what is most characteristically Catholic and human. Tradition, Miller argues further, is always embodied in a practice, a way of life, that grows out of the truth communicated within it and frees man for belonging in the world. Miller finds that modernity’s disincarnate isolation of the individual’s self-determination from his inheritance subjects him to the very instruments through which he strives to master and reconstruct reality. In “Olivier Messiaen and the Promise of Avant-Garde Traditionalism,” Jennifer Newsome Martin presents the French composer as engaged in the task, exemplified by his compatriots Henri de Lubac and Jean Daniélou, of rediscovering the wellsprings of tradition. The very innovations that characterize Messiaen’s works express a recollection of premodern sacred music, including Gregorian plainchant. Martin illustrates how Messiaen employs musical techniques both old and new precisely in order to gesture in his pieces toward the God whose eternal presence is the abiding source of tradition and the guarantee of its perennial newness. In “Tradition as Gift: On the Theologian’s Responsibility to Tradition,” Rodney Howsare defends theological thought against the accusation that its stewardship of tradition’s legacy is irrational. Together with Blondel, Howsare argues that modern philosophy has diminished the scope of reason by either reducing its purview to “facts” or utterly withdrawing truth from history. “What Blondel finds missing in both extrinsicism and historicism is the twofold truth that God reveals himself in the concrete (in time and space, and through a particular person) and that God reveals himself in the concrete.” Recovering the roots of Christian tradition in the economy of salvation, Howsare recalls that this gift, even as it transcends time, is shared in order for its plenitude to be ever-more richly unfolded in the Church’s memory by the Holy Spirit.